This was shared by a dear friend in the Virtual world. While we have not yet met in person, we share many similarities at a level of the heart. Thank you Robin. While this quote was very timely, as things usually are, it began a deeper understanding of self. 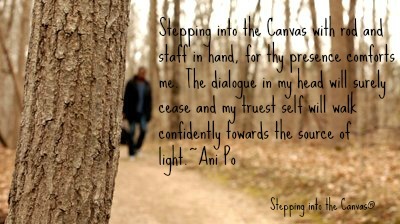 Over the past week I found myself in a deeper contemplation of who I am and whom I am to become. After pondering this…I realize I am who I am. How did I get here? I never left, but something remains different in ways indescribable by words of a page. The Lord is my shepherd; I shall not want. Psalm 23 comes to mind in this instance, with a friendly reminder of another charging me to dwell in the house of the Lord forever. While I have quoted this Psalm numerous times and have made reference to its time of reading. While it is usually reserved for a time of transition…a time of ones physical death…it has a much deeper meaning. In many instances we all come face to face with our darkest of moments, some greater than others, but assuredly they remain in our darkened past. In every persons life there is a transformation of self. Carl Jung often refers to this the transition between the morning and afternoon of our lives. It is a time where we stop to consider the path chosen (or not chosen) to go, considering those we have hurt or lifted up along the way. It is a time of our youth fading away and a deeper meaning or purpose begins to creep into our lives. Sometimes slowly, often with a great hurricane. Those willing to change find happiness; those unwilling remain forever in the past shadows of their lives. Psalm 23 invites us to walk our own living death, allowing the past to die off and a rebirth to take place. Though I walk through the valley of the Shadow of death, I will fear no evil. My death began ten to eleven years ago, without any warning…but one day the signs were to great to not take note. Eleven years later I still have doubt of who or what I am to do. How can I help anyone, knowing that we ultimately have to save ourselves? Ah..but I can allow others to follow their path in return stay true to my own path. My walk through the valley of death is soon to be over, but my table awaits me. This entry was posted in Inspiring, Life Lessons, self actualization and tagged Ani Po, daily quote, daily quotes, good, gratitude, happiness, Heaven, heaven on earth, hope, inspire, inspiring, John Monson, Joseph lieungh, Light, love, moving mountains, peace, quote, quotes, self actualization, Stepping into The Canvas, Tao, the way, true-self by Joseph. Bookmark the permalink.